Your chance to win a delectably delicious prize from one of our neighbors. Thank You to everyone that entered. Winners were selected using the random number generator at Random.org. There wasn’t any right or wrong answer to our question. Look for our next giveaway coming soon. This is how the Giveaway took place. Southern Supreme Nutty Fruitcakes are made right here in North Carolina. All those Christmas in July sales got me to thinking about Christmas. How about you? But, since I didn’t have anything to sell in July, I figured August would be a great time to give something away here on Taste of Southern. We’ll make it super easy for you to win, so just keep reading. Just one of the most delicious, and we sincerely mean that, nutty fruitcakes you’ve ever tasted. And, I sincerely mean that as well. I love these fruitcakes and I think you will too. 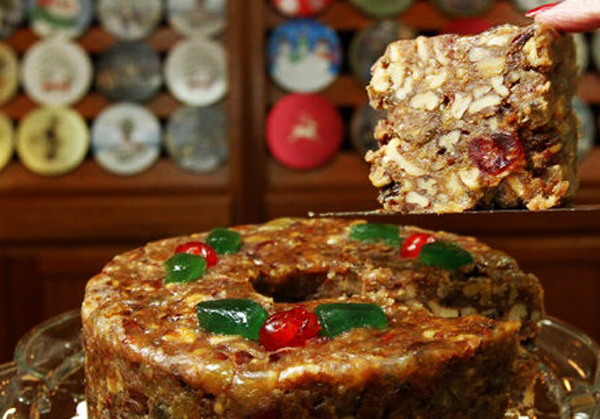 We’re giving away ONE – 3lb Southern Supreme Nutty Fruitcake to one lucky winner. It could be you. I want you to be able to try one way before Christmas, so you can have the opportunity to order some for your family and friends as Christmas gifts this year. Southern Supreme Fruitcakes and More is just up the road from where I live here in the Heart of North Carolina. I’ve shopped with them for years and shared many of their Nutty Fruitcakes with my own family and friends as Christmas Gifts. They never disappoint. You do need to know though, that Southern Supreme is not participating in this giveaway in any form or fashion. They barely even know me other than all the questions I ask when I’m in their store, and maybe because I like to spend a lot of time trying all the free samples they offer daily. Smile. But, they are great people. They have a super line of great products. They are a neighbor. I love their products, and I just wanted to share one with you. Just that simple. You’ve got 3 chances to win one of our “Peach” Tote Bags. Look how Nutty this Giveaway is. Just jump down to the Comment section below and answer this question. There is no right or wrong answer. Just enter your comment in the section below and you’ll automatically be entered in our Christmas In August Giveaway. Simple enough? We’re running this giveaway all through the month of August. Contest ends at midnight on August 31st. So go ahead and enter while you’re here today. At the end of the giveaway, we’ll select one winner by random using the random number generator from www.random.org. Again, there is no right or wrong answer. One entry per person please. First Prize: 3lb Nutty Fruitcake from Southern Supreme of Bear Creek, North Carolina. Contest ends at midnight Eastern time, Friday – August 31, 2018. Winner will be posted Saturday on September 01, 2018. Your name and shipping address will also be shared with Southern Supreme. Your prize will be mailed as soon as you respond so you can enjoy it way before Christmas. Thanksgiving night after everyone is asleep. These fruitcakes are the best! We start our shopping after Thanksgiving. Hope we win I can taste it now! Typically I start in September. Not sure that will happen this year but that is the plan. Prayers for continued success with your subscription. I start sometime in November. I order online and try to find bargains that my family will like! I start as soon as I find something that will work for one of my friends or family, and this year it was in June! Books for my girls as they are all big readers. I stopped Christmas shopping once my son grew old enough to know the real reason we celebrate Christmas. As for Fruit Cake, I have yet to find one I can say I really like but this particular one just looks different than all the others. It actually looks delicious! I start shopping after Thanksgiving. One holiday at a time! The first auction in January. I am almost finished, I’ve been in the hospital, so I took advantage of it! Hi Steve! I shop for Christmas all year. I love to find special and unique gifts for my friends and loved ones. I have a special closet in my home fitted with shelves where l keep things cataloged and stored until the Big Day. I host a special party each year for the Grands. I typically start shopping in August! 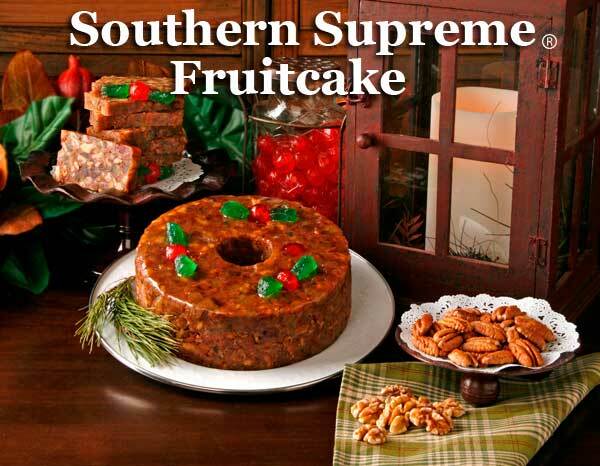 I love Christmas, and I love Southern Supreme fruit cake! Don’t do much Christmas shopping anymore. Too hard to get out at my age. Cash always fits and is the right color. I do get a present, usually online, for my great grandaughters. At 4 years old they don’t understand cash. I just found your website a couple of months ago. The way you write, the recipes etc remind me of my NC childhood. Love it. Our family has been migrating from the gift giving aspect in Christmas. Wow, all the relief of stress and gift shopping. Its great! We treat it now as we would a Thanksgiving dinner. Just enjoy everyone’s presence and reflect more to the Birth of Christ. It all seems so much more peaceful and calmer now when we gather together. No hurt feelings in the monetary end on who spent how much, the wrong style or color and no returns. I would suggest everyone try it once. These are the best fruitcakes in the world. I so hope I win this. I usually give the grandchildren money but paint gifts for my children. For others I shop for gifts beginning all year as I see things that I think they would like to receive. My husband and I shop all year long . We have always enjoyed a “big” Christmas, usually on a small budget. So we take advantage of sales throughout the year, starting with the day after Christmas sales! My husband is a great shopper, a gentle considerate man and shopping for his kids and grandkids (and for me) is a true pleasure for him. I usually start my shopping for him in September, and more and more online. Every year I try to start in August. But pick up things I like as gifts through out the year. I typically shop for Christmas gifts all year long! If I see something, I pick it up and put it away. The trouble is, as I get older, remembering what I bought and where I put it! LOL Merry Christmas in August and thank you for this fantastic giveaway opportunity. I LOVE fruitcake and all things North Carolina! I try to start in October. It makes me feel I’m ahead of the game. Even if it’s only one present. Love your recipes, Steve. Hope you are feeling better soon. I start right after Christmas when things are half off, i just get everything clothing item 2 sizes larger.. I’m done before Christmas may get a few extra things around November on the aftet Thanksgiving sale. I try to start in November, but inevitably it turns into the week before. I am a crafter and love to give homemade gifts all year long. The Christmas spirit is with me all year long, and that’s when I shop for gifts. If I see a particular gift that I know someone will love, I go ahead and get it, then store it in my gift closet till Christmas comes. This leaves the holidays free for enjoying family and friends. Hi Steve, I always start my Christmas shopping on Nov 1. It feels like the kickoff date for the upcoming holidays. Usually the middle of November I start looking for the great grandkids. I do not do any Christmas shopping! My wife does it ALL and she even buys her own presents. I used to surprise her years back but we are through with diamonds and big stuff. November and December for me! I usually start shopping in November. More on-line than retail stores. I REALLY, REALLY would love to win this fruitcake because last year I ordered one from Jane Parker at your recommendation. I paid $25.00 for a one pound cake. And I don’t even like fruitcake! I ordered it for my better half who loves fruitcake. I’m more of a chocolate person myself. to add! Had 3 Grands born in the same month–my daughters are SO competitive! I start saving money in January. Each month I add X amount of money to our envelope. Save the same amount each month…just like a payment. You can’t disappoint grandchildren and great-grandchildren. So much fun – Life is a gift!!! I usually dont start until December! Hi, Steve, we quit shopping for Christmas a few years back when things got difficult for us. My god-parents from KY send us 2 presents (one each) every year for Christmas. My husband and I wake up Christmas morning and each will open his and my only present. We are happy with that. I came from a communist country. There are lots of people who don’t know the Lord to celebrate His Birthday and many don’t even have enough food to eat. The government makes everyone go to work and school on Christmas day to prevent people from celebrating Jesus’ Birthday. We consider ourselves blessed here in the USA even if each of us has only one gift to open. We have plenty to eat. We have FREEDOM and LIBERTY, that are far more than the people in my country have. We are very thankful that Jesus is our Lord and Savior. Thank you for taking the time to write your newsletters and to share your recipes with us. Thank you also for giving us a chance to register to win this cake. It’s been decades since I did Christmas shopping. I start the first of November. I usually start my Christmas shopping in early November. Hi Steve ! Mostly Nov and Dec for me, Merry Christmas ! Hello Steve. I’m a last minute person. The week before. I shop all year around, I look for deals and promotions and its easier than trying to buy everything in just a couple months especially when my budget is small, I love Christmas and I love my family more than anything! I start Christmas shopping the last week in November. If I see something any time during the year that would make a good gift for someone on my list, I usually buy it. Since I have gotten “older” most of my shopping is done online. Generally start with online orders in late November or early December. I typically start shopping for Christmas gifts in January to take advantage of the sales after Christmas. Then I pick up gifts throughout the year when I see something someone might like. I actually begin to shop for Christmas the day after Christmas during after Christmas sales. Then, throughout the year, when I see something that I know a particular person I am buying for will like…no matter where… I will buy it if possible and stow it away until Christmas. So, to answer the question… I buy Christmas presents all year long whenever it is indicated to do so. Thank you for asking …and Be Blessed ALL Of you !! Christmas is in the heart any time. When funds are available or the right craft is there, it’s Christmas! I rarely “buy” Christmas gifts. I am a heavy duty crafter and usually create gifts for every one on my list. This means that I create goodies all year and sometimes get ideas for birthdays. Of course, the birthdays are equally important! One great granddaughter commented that she was depressed when she didn’t get another critter from Grandmother! I usually start in November. Love to shop all year, so as to have plenty of time to find unusual gifts. I start in December…Unless I find something I have to get for someone before then. I love Christmas,so shopping is so much a part of that. I shop all year round, but get really serious after Thanksgiving for the people I still need to shop for. I am terrible. I work retail so I usually start my Christmas Shopping just a few days before Christmas. I love the hustle and bustle of Christmas shopping. I’m unfortunately a last minute shopper and I like to go and get everything in one day. Last year I bought all the presents just a couple days before Christmas. Shop throughout the year when I see something I think a family member or friend would like. October, but I probably should start earlier. I should start shopping in October when the crowds won’t be as bad, but usually don’t get around to doing any buying until November and the beginning of December. Usually I do one person gifts starting in June to avoid time crunch and money crunch. I don’t shop much for the holidays anymore – the past couple years have made gift plates/baskets/boxes of baked goods, toffee and brittle for local family/friends. This year will learn one new baked good recipe and make brittle. We all seem to have more fun just making the time for a visit and enjoying one another’s company. I usually try to get all my shopping done by Thanksgiving. I find that Christmas comes too soon after and sometimes the gift I want is gone and no more coming. It makes the holidays less stressful! I usually wait until December, sometimes Christmas Eve for the sales. I start my Christmas shopping whenever I find something in a store that I know is perfect for the recipient. I also crochet so I start early on items that can take a long time to make. I like to be done with my shopping prior to snowfall, but that doesn’t always happen. I like to start Christmas shopping in July! Our list gets simpler every year as we have grown to treasure the relationships more and more over the packages! Love your newsletters and website! I start Christmas shopping anytime I spot a gift just right for a particular person on my list. I don’t have any gifts at this moment. Nothing caught my eye as I walked through stores I’ve been to. Something will come soon enough. I liked to live dangerously and wait until December to start my Christmas shopping! I usually start in September but invariably never get it all done before December. Always something coming up to put off (well at least that is what I tell myself. Would love to try the fruitcake! I haven’t had need in a long time. My parents would always get one every year. Brings back memories. I usually start shopping the month before and then go crazy right before Christmas. start shopping in July, the best deals! God bless! Usually, we leave it to the end of November, but this year I have already bought a couple of things that may not be around by then. Hi Steve, I am always on the lookout for items for my grandchildren for Christmas whenever I am shopping so I guess you could say I shop all year. One bedroom closet always has “gifts” stored that can be used for any occasion or “just because”. And I only buy things that are on sale! By the way, love these cakes. I ordered 2 of them last year. They freeze well too in case you have any leftovers. Usually sometime in November, although I really get going once December hits. I usually try to start in August. I’ve been making Christmas ornaments for family members since last Christmas. I like to enjoy each holiday before jumping into the next one so, after Thanksgiving is time enough for Christmas preparations. I can say this as I am older, kids and grandkids are grown and I usually just make goodies to send to all! Makes for a busy kitchen in December! I start thinking about what gifts I’m going to buy much earlier but I usually try to start my actual Christmas shopping in October. I try to start shopping early November, and get most of it completed by the first week in December, as I have a large family! I “may” pick up a couple of items for my girls during the year if I see something unique when we’re on a trip. But mostly I wait until November when the Christmas Wish-Lists come rolling in. I do most of my shopping online…very seldom ever make it to the mall. Absolutely cannot believe only 148 days left!!! Southern Supreme is a great choice!!! I love their fruitcakes! Don’t shop any more. I just give gift cards to their favorite stores or restaurants. I do wrap them up pretty. I have my Christmas shopping finished by October.Going to try this salad it sounds good.THANKS Steve for all you do. My first grandchild is due the middle of December so I’ve already started shopping and am almost done. I want to devote all my time to the new grandbaby and his mom & dad. I try to pick small things all year long and then begin to get serious about mid October. I love to get done early so I can just enjoy the season. My Christmas shopping begins when I see something I think one of the nieces and nephew will like, so it is not a certain time. Just whenever I see something I like. Not so long ago I would get all my Christmas shopping done by the end of summer. Nowadays I may be ordering from Amazon the middle of December! My Mom and Grandmother used to make their version and cook them in coffee cans to send to the ‘Boys’ overseas in WW 2. I’ve cooked that recipe and only recently found my sons didn’t like the fruitcakes. Heathens. I loved it. I usually start in November but always wish I had started earlier. I try to be finished by the 15th of December but am still buying on the 24th! I also have a book on defeating procrastination that I have been trying to finish for about 15 years!! I always say I’ll do better the next year but usually end up shopping after Thanksgiving. When I do occasionally shop early, I “hide” the gifts and many times, forget where I’ve hidden them. I start the day after Christmas. I enjoy the sales and try to hit the stores for best price reductions as well as best quality items. I also replenish my decorations during this time. I usually officially start after Dec. 2nd (my birthday) but may pick up a gift or two before then if I come across a good deal. Thank you for the opportunity to win a great prize! I really enjoy your website and have tried a couple of your recipes! They could die or I could before Christmas so why not make them a present whenever you can. I pretty much shop all year around for special gifts for my special people. Not so many of those around anymore. It’s no fun getting old, and losing your family so I try to treasure the few that are left. Hope you feel better soon Steve. My Mother had Vertigo on and off for years, and hated when it happened. I always promise myself that I will get started early, although it never happens. I typically try to get started early in November but I’m still shopping well into December. Love your site and so appreciate all you do to keep us informed. Christmas. The sales are better then! I usually start shopping online in August for Christmas. Then I have the items shipped to my sister in Tuscaloosa, AL. She wraps them and keeps them for their Christmas. For my family here at home, I shop mostly local stores. I love shopping for Christmas. I usually start shopping in November, unless the gift is a quilt, then I start much earlier. Love your newsletter. Generally, any shopping for Christmas presents we do is online. Neither one of us likes to go to the mall or a department store, especially that time of year. Too many people and parking is a nightmare. The only thing I will get at a Walmart or a dollar store is cards. Otherwise, sometime in December we will get what we need for family members online. Steve, this is a great and fun giveaway you are having. God bless you. I usually start at the beginning of the year; when I’m out shopping if I see something that would be perfect for someone in my list, I’ll buy it and put it away. I also make a lot of the gifts I give. I make Christmas stockings for all the children at Church each year to give out at the Church party. These small, embroidered stockings have become collector’s items for the grown up folks. I usually try to begin my Christmas shopping in July or August and have it completed by October. Most years I manage to reach this goal, but some years I fail. Praying God blesses you with His healing of your vertigo problem. Please take care. I’ve already started, to spread the cost over several months. Thank goodness I Don’t have many to buy for, and I like to donate gifts to the children’s charities. You’ve got me actually wanting to try that fruitcake! It looks good. The lemon cookies on their website also look good. Typically I do not shop for Christmas anymore. My wife buys for the grandbabies. She and I just enjoy each others company and being with family as we celebrate the birth of our Lord. I look every time I shop for anything, and just in case there isn’t anything worth getting, I knit them a pair of socks. I don’t live in NC anymore but my kids do, so send my fruitcake there, I’ll fly out and eat it. Sometimes I pick up something earlier, but I usually begin most of my Christmas shopping around the first of December. I usually start Christmas shopping the day after Christmas to take advantage of the sales and then continue throughout the year. My family has gotten much smaller now so it’s not so much of a burden anymore as it once was. I start window shopping for Christmas in September. However, if I find something that I really like before then, well, I will go ahead and buy it. Yet, I do try to wait for the Cyber Monday to get the best deal on electronics. For example, last Christmas I was able to buy my mom a tablet for over half off because I waited. It was originally $180 but I paid only $80 something for it and I bought it from Best Buy. Embarrassed to say, but I wait until 2 weeks for shopping. I absolutely LOATHE shopping, any kind of shopping. My grands usually give serious hints in October for items they “can’t live without”. So my shopping begins before Halloween is even here. It’s their way of letting me know christmas is fast approaching, in case I might forget. Smile.. I don’t have many presents to buy so I usually do it all in the two weeks before Christmas. I am a “last minuter” . On very rare years I might start in October but it is usually December. about the middle of december. (mid-day meal for us in alabama). I make many of my Christmas gifts, so actually I begin doing that right after Christmas and throughout the year. I make preserves and pickles from my garden, knit sweaters for grandchildren, and hunt for vintage items in thrift shops. And just to mention, I love fruitcake. Generally I start Christmas shopping soon after Christmas. You can pick up wrapping, bags etc on sale then. During the rest of the year I pick up stocking stuffers when I see them and know that someone would like it. Then about Oct. I start picking up the big stuff for the grandchildren. I usually pick up a few items all year long if I think they would be enjoyed by folks on my Christmas list. An example would be the beautiful tiny hand-made Christmas decorations I found while traveling in Germany. Otherwise, the bulk of the shopping starts around November. They have to be items people can return through the end of January, just in case. I don’t care for the last-minute rush. I like to give some thought into what each person would like. Still, Christmas is a special time of year. Love the winter season. Blessings and prayers that your vertigo clears up soon. Steve, if I see something I know someone would be thrilled with I get it right away…especially if it’s on sale☺ The only problem is I sometimes hide them so well they aren’t found until after the holidays. Of course this just means when I find the well hidden items i can extend the joy of giving time. I typically start shopping for Christmas gifts the week before Christmas. I usually start shopping at the beginning of December. Sometimes I shop a little earlier, but not usually. The Christmas decorations and atmosphere put me more in the mood to shop since I don’t really care for shopping the rest of the year. My Christmas shopping usually starts the Friday after Thanksgiving with the sales. I start shopping in November and enjoy looking at all the items for sale to get the perfect gift for all the loved ones on my list. year I’ll grab it, then and store it until the BIG DAY! My wife and I always have Christmas in mind. We’ve been known to buy a gift or two as early as April! We try to be finished with the bulk of the shopping for the holiday well before December. I start Christmas shopping in the summer for I give my 2 kids and my 2 grandkids a small gifteach day, 12 days before Christmas and call it the “12 days of Christmas”, plus a few things to open on Christmas morning. My shopping is generally Amazon gift cards which doesn’t take much effort. However, if I see some little items during the year I put them aside for stocking gifts. I usually start shopping in November. I start Christmas shopping about anytime I see a gift that might suit someone on my list. I usually give the kids money and let them buy something they need.